I've tried editing my main menu and it has been going well. How can I edit this? I've looked in both GameMenu.res and MainMenuOverride.res but I can't seem to find it. Is it in a different file? vanitasI've tried editing my main menu and it has been going well. Pretty sure it's called RankModelPanel or RankPanel in MainMenuOverride. [quote=vanitas]I've tried editing my main menu and it has been going well. I want to change the class images in the loadout panel: how do I do it? Where are the files I need to replace, and what do I do with them? Can someone help me update my TerminalHUD? I have the info.vdf file's "ui_version" set to 3 but when I join a server and I press Tab my scoreboard is broken, thanks! How would I go about removing the black background behind of the numbers in this HUD? [quote=solly6]Is there a way to change the color of the model panels in the backpack section? Tried scuffed copy and pasting the HudMatchStatus.res file from hypnotize m0re over to an older version of m0re black that i've been messing with. I've got everything working okay (fonts, spacing) but the respawn timers like the ones in the image above aren't working. sAvenHow do I edit a HUD to make it "Linux-compatible"? I've seen certain controls with [OSX] or [X360], which I assume only execute on Mac and Xbox 360. Is there something I'm missing? Basically just make sure to use lowercase folders and files, and if font size needs to be exact then make all fonts be 80% as big for linux. You'd use them whenever you want to do something differently between different versions, but if you just want the same hud in all there's very little you actually need to change. [quote=ProSkeez]Tried scuffed copy and pasting the HudMatchStatus.res file from hypnotize m0re over to an older version of m0re black that i've been messing with. I've got everything working okay (fonts, spacing) but the respawn timers like the ones in the image above aren't working. You're correct that it needs further animations to work correctly. From [url=https://github.com/Hypnootize/Hypnotize-m0rehud/blob/master/Hypnotize%20m0rehud/scripts/HudAnimations_m0re.txt#L220]Hypnotize-m0rehud[/url], copy the [i]event TeamStatus_PlayerDead[/i] and [i]event TeamStatus_PlayerAlive[/i] sections in to your own HUD's animations. How do move the new item notification or relocate the menu options? Hey guys, I'm working on my own HUD while following raysfire's tutorial, and I decided to make a line that separates the ammoInClip from AmmoInReserve. It looks quite nice, but it's all messed up if using NoClip ammo, because said separating line is not aligned with the numbers. Is it possible to make it disappear when using NoClip ammo? Also it would be cool if I could use a team colored ammo separator that changes into a thin line under NoClip ammo when using such. Thanks in advance. I've been trying to change the font of my targetid health value. I just want that 150 in that screenshotsto use HudFontSmall/TF Secondary. I've tried changing stuff in targetid.res and the Targetid section of clientscheme.res. What files/lines am I supposed to edit to change the font of the targetid health value? I even tried changing the color value to some other random values but it never changes. It also says in my color scheme that damage numbers are 255 255 255 255. I've used other HudDamageAccount files from other m0rehuds that have white damage numbers but it still ends up being that red color. Is this something that I edit in HudDamageAccount or is it something else? Still this: Also I would like to get rid of the "-" and just see the number itself. How would I do that? ThatGuyInADressHey guys, I'm working on my own HUD while following raysfire's tutorial, and I decided to make a line that separates the ammoInClip from AmmoInReserve. It looks quite nice, but it's all messed up if using NoClip ammo, because said separating line is not aligned with the numbers. Is it possible to make it disappear when using NoClip ammo? Also it would be cool if I could use a team colored ammo separator that changes into a thin line under NoClip ammo when using such. Thanks in advance. If your AmmoNoClip looks the same as and is in the same spot as your AmmoInClip, then you can. Make a new label (called "AmmoAlways" or something) that looks like your AmmoInClip / AmmoNoClip. Then make your AmmoInClip's labeltext be "_______" or something, so that it becomes that line that separates them, and make the AmmoNoClip not visible. This only works because if your AmmoInClip and AmmoNoClip look the same, you don't need to worry about them automatically becoming visible or not depending on what weapon you're using. So you can just use a new label that will always appear to replace both, and that means you can now use the AmmoInClip and AmmoNoClip labels for anything else you want to only appear with weapons with reserve ammo or no clips (in this case, the divider line for weapons with reserve ammo, and nothing extra for ones without). Because this is label shenanigans, doing anything team colored wouldn't work. You could have a teamcolored imagepanel and then cover it up with a label, but it's not quite the same as the line getting smaller. vanitasStill this: Also I would like to get rid of the "-" and just see the number itself. How would I do that? You can make another copy of the font you want to use, and edit it so that the - glyph is blank and has no width or kerning (note, if you just delete the glyph, tf2 will load defaults from whatever fallback font your system uses, which is not what you want). https://fontforge.github.io/en-US/ or https://birdfont.org/ are two good free font editing software options. Should be a matter of opening the font, editing the glyph, renaming the font inside the editor (needs to be unique and different from the previous font, otherwise clientscheme can't tell them apart), and exporting as otf or ttf (whichever the font originally was is the safer bet). Then it's no different from adding another font to clientscheme. If you want to make the font size smaller you can delete every glyph other than -+0123456789, since those are the only ones that'll appear in damage numbers and it doesn't matter if everything else gets defaulted to arial or whatever, but this is optional. Which part of FriendsContainer in mainmenuoverride.res do I need to get in order to get better fps when entering the menu? A screenshot would help. Yo, anyone know how to fix this? In Mixsis hud I can't find the settings button. prokyYo, anyone know how to fix this? It's probably meant to be a custom vtf for the low health. Have a look in hudplayerhealth.res, the image for PlayerStatusMarkedForDeathImage should be "../vgui/marked_for_death". If it's something different, put that text in and it should be fine. Edit: #5779 find FriendsContainer in mainmenuoverride and the very first part should have visible and enabled set to 0. That's all you need to do. [quote=proky]Yo, anyone know how to fix this? which file moves the control points? ControlPointIcon and ControlPointProgressBar, they're in resource/ui. There's one thing that i've noticed among all huds,the ammo and hp bug if you die when they're already low,so they stay red until they're low again,sometimes it doesn't happen tho,but it seems to be a code problem since it never ever happens in the stock hud but it happens in almost every custom hud,i'd like to see if anybody has a solution for this problem. SphaakThere's one thing that i've noticed among all huds,the ammo and hp bug if you die when they're already low,so they stay red until they're low again,sometimes it doesn't happen tho,but it seems to be a code problem since it never ever happens in the stock hud but it happens in almost every custom hud,i'd like to see if anybody has a solution for this problem. Where is the "your casual match is ready" dropdown element located? I restructured my entire matchmakingdashboard.res and now the match ready dialog is at the bottom of the screen, with the join and abandon buttons offscreen, and it's hard to find even the name of the element with drawtree because i have 10 seconds to scan for it. Also, is there a way to "simulate" events like a match being ready, queueing for your party's match, and post-match map votes without actually having to queue for a match? If you know the animation name you could to testhudanim and the animation name to have it pop up whenever you want. 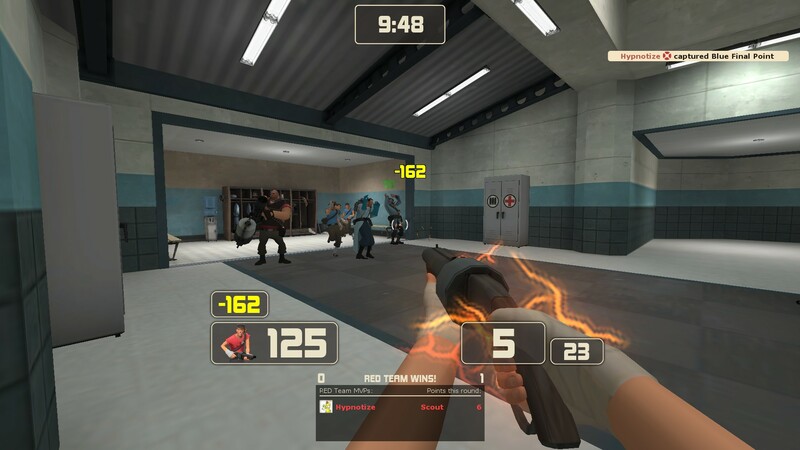 Also how can I move the [url=https://imgur.com/skDDhY8]respawntime value[/url] in the matchmaking hud? I tried changing the zpos and ypos values but it doesn't move.